I have the best job in the world teaching Clark Honors College students. I am consumed by enthusiasm for the material and own a deep understanding of the importance of critical thinking skills for responsible citizenship. I strive to balance challenge with encouragement, and make the craft of writing visible as the absolute center of student success. I encourage students to "own" course readings, to value their questions as well as their discoveries, to express their opinions as well as their confusion, and most importantly to embark on research, the mix among which fosters beneficial class contributions and deep, lasting learning. 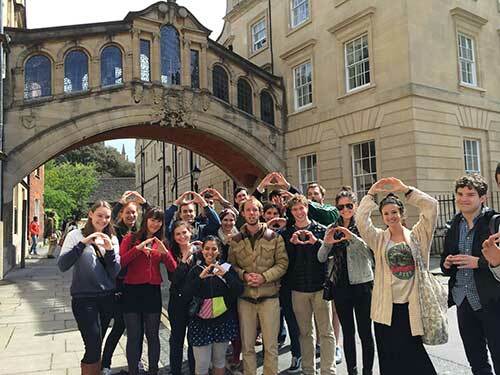 This faculty-led study abroad experience, available spring term and created by professor Bishop, brings Clark Honors College students to live in the center of the city of Oxford, England. During the quarter-long program, in parallel with Oxford’s Trinity term, students pursue their studies, including two tutorials taught by Oxford faculty at the oldest university in the English-speaking world. The tutorial system, in which students meet weekly one-on-one with an Oxford tutor, helps students develop their rigorous independent intellectual skills and provides incomparable preparation for the honors senior thesis project. Tutorial credits can be applied towards required CHC colloquium credits, and towards major requirements at the major department's discretion. The program and its students are housed at the Centre for Medieval and Renaissance Studies, affiliated with Keble College, Oxford University, and is located at the heart of the city and its ancient colleges. A participant in the Medieval Studies program, professor Bishop teaches primarily for the Clark Honors College, and occasionally for the English Department, at both the undergraduate and graduate levels. Courses she has developed include Inventing the Middle Ages, The Idea of the Vernacular, and The Middle Ages and the Movies. Bishop has served both on-campus and in the national sphere as an expert in the scholarship of teaching. 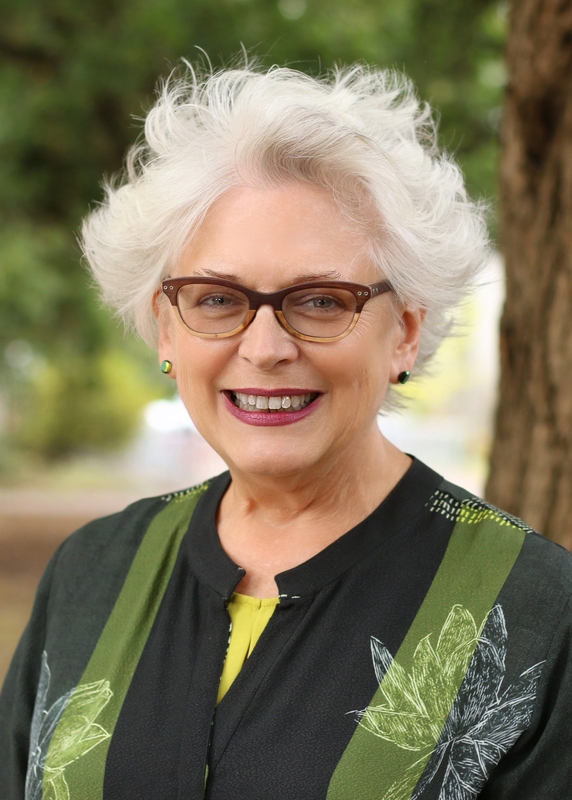 She also maintains a high level of involvement across campus, including four years as associate dean of the honors college, and committee participation ranging from scholarships, to the libraries, to study abroad, and enthusiastic support for the Center for the Study of Women in Society and the Phi Beta Kappa honor society. Bishop’s research concerns medieval English textual culture. She publishes on Middle English literature, including poets Geoffrey Chaucer and William Langland, and Middle English prose writer Reginald Pecock. Her current research treats the afterlives of medieval English poets and poetry in the literature of sixteenth through nineteenth century England. For a complete publication list see Professor Bishop's Curriculum Vitae. 2007, Words, Stones and Herbs: The Healing Word in Medieval and Early Modern England (Syracuse University Press). 2015, "Reginald Pecock's reading heart and the health of body and soul," Medicine, Religion and Gender in Medieval Culture (edited by Naoë Kukita Yoshikawa), Cambridge: D. S. Brewer, 139-58. 2014, "Piers Plowman: Text and Context," Studies in Medieval and Renaissance Teaching, 21.1: 27-36. 2011, "Chaucer," Icons of the Middle Ages: An Encyclopedia of Medieval Masters (edited by Lister Matheson), Greenwood Press, Volume 1: 175-204. 2009, "A Trace of Chaucer in Shakespeare's Winter's Tale," Shakespeare and the Middle Ages, (edited by Martha Driver and Sid Ray), McFarland Press, 232-244. 2009, "The myth of the flat earth: Did medieval people really believe in a flat, rather than a round, earth?" Misconceptions about the Middle Ages, (edited by Bryon L. Grigsby and Stephen J. Harris), Routledge, 97-101. 2009, "Belonging in Belongings," Oregon Humanities, summer: 29-32. 2007, "Raising Authority: Father Chaucer and the Vivification of Print," JEGP, 106.3: 336-63. 2002, "'Of Goddes pryvetee nor of his wyf': The Confusion of Orifices in 'The Miller’s Tale,'" Texas Studies in Language and Literature, 44.3: 231-46.